Three hundred London bus conductors are to lose their jobs to make savings of £10m a year, Transport for London (TfL) has announced. 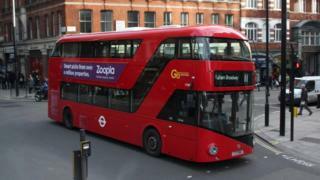 The conductors work on New Routemaster buses, introduced in a blaze of publicity by ex-mayor Boris Johnson. The changes mean passengers will no longer be able to board the buses by hopping on/ hopping off. TfL claimed having conductors on board made only a "modest difference" to customer satisfaction. The conductors will disappear from six bus routes; numbers 9, 10, 11, 24, 38 and 390. They are employed by operators Arriva, Go-Ahead, Metroline and RATP. TfL pledged to work with those companies to provide support and information on job opportunities for sacked conductors elsewhere. The New Routemaster buses were a flagship transport policy of former London mayor Boris Johnson and were used as a political tool during his 2008 election campaign. Criticisms were made over the cost of the new buses and there were problems with their hybrid engines and non-opening windows. However, BBC Transport correspondent Tom Edwards said Londoners had a "begrudging affection" for them. A small number of Heritage Routemaster buses on route 15 will continue to operate with conductors. The role of conductor on the new buses was more for safety as they didn't sell tickets. They made sure passengers didn't hurt themselves jumping on and off the rear platform. Now 300 of them will lose their jobs. They were introduced by the mayor Boris Johnson, but now he's gone the flagship projects of the former mayor do not have as much political protection. We are also seeing the start of big cuts at TfL, with its operational grant from the government cut by £591m in 2018. Meanwhile the new mayor's TfL fares freeze will cost £600m, and on Friday there was a redundancy trawl for senior managers. So this won't be the last cuts we see. What is a big surprise though is that front-line staff are seeing the cuts so soon. That will inevitably lead to political fall-out.